As much as I enjoy studying the Pottery Barn catalog, I'm really more of an Old Time Pottery kinda girl. 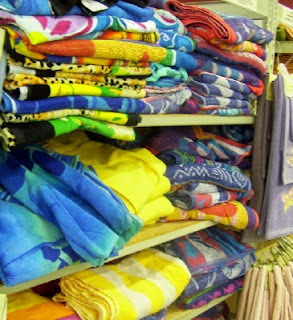 My quest for beach towels in December took me there this week. Luckily, I found an inexpensive set...along with so many tempting Christmas items. Everything, everywhere was stamped Made In China. (Not the towels, thank goodness!) We're not avoiding all Chinese imports. Who can? 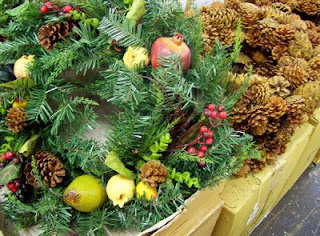 But for the first time in my shopping career, the thought of Chinese labor conditions made pretties like this wreath a little less beautiful; the low, low prices, a little easier to resist. I totally agree! Afraid a little lead paint will end up ingested into my children? How about that pregnant mamma spraying hundreded of them!!!! I don't have answers for all the problems in the world. However, I do offer prayers for those who don't have as many choices as I do! I need to check this out. I searched all summer for beach towels at garage sales with no luck. Have you ever read Randy Alcorn's book "Safely Home"? It weaves together facts about Christian persecution in China into a fiction story. After reading that, I have never been able to look at Christmas lights the same way again. This is how I feel when I walk through WalMart- all these nice, useful things become totally less appealing when I think of the conditions those who made them work in overseas, and the struggle to 'get by' that those who work for the company here have. I have read Safely Home. And from some background I have looked into, the conditions are pretty accurately represented. It's a challenging read, not from a language perspective, but was a definite challenge to my mindset and my look at the world outside my little bubble. Safely Home was a key turning point in my decision to avoid MIC products. The one-child forced abortion policy is another.. I haven't read Safely Home yet. I'm sure I've stayed in my own little bubble of ignorance partly from my own choice not to know! However, I've read so many blogs where people are thinking a layer more deeply about spending. It's rubbed off. I am happy when my desire NOT to spend money is reinforced by an ethical concern. It makes it that much easier to stick to my guns in both arenas. The beach towels were a Christmas gift. I hear you. The dollar store and Walmart has lost a lot of it's appeal to me now. I can't help but think of some child or a mama like me half way around the world not getting a fair wage and being put in harmful positions. We are so blessed in this country. But it's not just Walmart. If it was, it would be a lot easier to avoid the MIC items and just buy elsewhere. However it's also Target, Kohls, KMart, the local gift shops, etc., etc. Unfortubately, until there is a mass uprising in this country over the conditions in China, the lead paint on who knows what products, and the loss of manufacturing jobs in the U.S., those who wish to avoid these products are going to have a very difficult time. I say, yes, vote with your pocketbook! Whether it be lead contamination, unsafe or underpaid working conditions at the production level, protesting China's social policies or US's economic policies, voting with your pocketbook is the way to make your voice heard in our demand-driven, consumerism/capitalist system. For years my husband and I willingly paid more for our "things" (and had less than many of our peers) so that we could avoid MIC. Now it seems that no matter how much one is willing to pay it's hard to avoid. We've bought our kids Ecco shoes for some time, choking down the $40 price tag (or buying thrift when we can) knowing that the expenditure was in alignment with our values. A couple weeks ago our son needed new church shoes and, my hoarded "grow into" stash and thrift coming up empty, went to our local kids' shoe store and found...boys' Ecco shoes now MIC. It broke my heart. I happened across a book called "A Year Without 'Made in China'"at the library the other day - on the new book shelf - and I snapped it up. I was actually considering sending you an email, Meredith, to recommend it! I'm glad the topic came up. It's an interesting read - I've reached the summer and her husband's insistence on buying an inflatable kiddie pool made you-know-where - but I keep wondering when she's going to try looking at thrift stores and garage sales for consumer goods. I have avoided buying anything MIC this year for Christmas. It was very hard, but I cannot stand knowing that there are mothers like me making pennies to fullfill my daughter's wish. If I shopped at clothing stores, I asked the sales people if they knew for a fact that their clothes were not manufactured in sweatshops. If they could not answer, I walked out empty handed. So far, I have not caved. My friend's concern was basically the lead paint issue. She purchased a lead testing kit, and went ahead and bought the item and tested it at home. I am not willing to take any chances, though. I live in one of those third world countries, although not as an employer. You know what? There IS another side to the question. I'm not advocating poor working conditions, but I have friends who work 'for sub-human salaries, in sub-human conditions' and are very, very grateful for their jobs. If they didn't have them, they'd starve. People who don't buy the products they produce, are ensuring that they'll get fired. And then they won't have any salary at all. That's not a very merry thought at Christmas, is it.